The quest for the signature scent continues. Yes, I have those few perfumes I wear on a daily basis. But let's face it ... what woman truly loves to wear the same scent day in, day out for her entire life? Maybe I'm just too fickle to be tied down like that. In any case, the next great fragrance has just come into my life, and I'm oh so glad! And this one comes complete with a twist. What amazing product do I speak of? 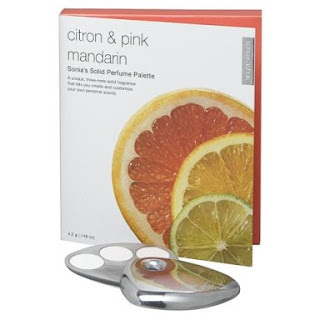 Why, none other than Sonia Kashuk Solid Perfume Palette in Citron & Pink Mandarin, of course! At first glance, you'll see nothing but a gleaming silver palette, shaped a bit like an egg. But once you twist it around and see what's within, I dare you not to be impressed! What looks like three eyeshadows in varying shades of pink and white is actually three solid perfume notes -- labeled as Top Note (neroli blossom, blood orange, basil and bergamot), Middle Note (water jasmine, white lavender, orange flower and peace lily), and Base Note (musk blossom and cedarwood). But that's not all! You can mix, match and blend the three notes to really and truly find your signature fragrance. Dab the powders on your wrists, neck, pulse points, decollete ... anywhere your little heart desires!